it seems that a Separate-from-main large-enough Senkyo can set the body for foundation for meiji 35 years, and a Zokujin -- if the "Jinpyokaku" wished and named passes through the gate of a structure profound one step as the name suggests, the quiet garden surrounded by the high grove will not hear even people's voice.A building inherits well the tradition of the long-established Ryokan which is mainly a building of a Narimoto Taira year, and has become a dignified building.It was the touch which the feeling to touch hot water of the hot spring was good, and the open-air bath was large, could be enjoyed to cascading water hot springs to the Jacuzzi, and was carried out gently till the next day.Although the combination of a creation dish was unique apparently to this traditional lodge, dishes were passion, love and a taste, and a creation dish that is not in others. 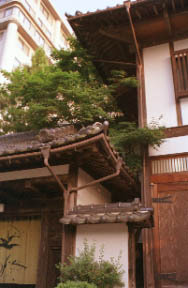 It is dotted with a dignified wooden structure. The profound structure in which an out bound beams supports a roof. 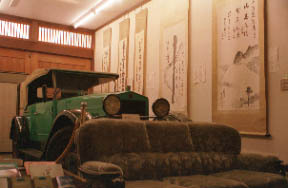 The work, paintings and calligraphic works, and classic car which many writers and artistses, such as Akiko Yosano, woods Fumiko, and Yasunari Kawabata, left are exhibited.KURASSHIKUKA which welcomed and sent off Soseki Natsume may have been exhibited. The creation course dinner of a madam hand structure. A rainbow trout and others are seasons. The charcoal-fire fillet steak of the Shinshu beef raised from the apple, sukiyaki, etc. "The near real fly of the rainbow trout" is a time-tested product also in the creation dish. 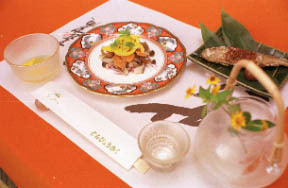 The vinegared of the slice of a raw Japanese pumpkin and the fruit of a grape and the frying-without-coating mushroom garnish of a trout have a dressing poured. Meal place: The restaurant of every morning and evening and a single room. 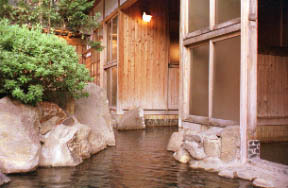 <> The open-air bath has jutted out into the Separated by gender outside from a cave bath (mixed bathing) and there between man-and-woman indoor hot springs.These three open-air baths are connected as one bathtub, and are sizes remarkable on the whole. <> They are those with cascading water hot springs to both man and woman. <> It is a Jacuzzi to ladies' bath. 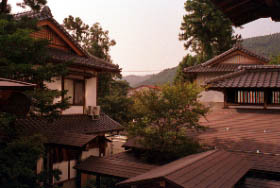 The Youshun-tei which was renewed in 2015 and equipped with the hotspring bath room. The work which the celebrities associated with a "yen fruit" kanbayashi left is exhibited. Nagano station -> Nagano Electric Railway yudanaka -> it is an electric railroad bus and is a kanbayashi. Only delivery is to a yudanaka. more than 10 persons -- measure with micro pick-up -- please consult.